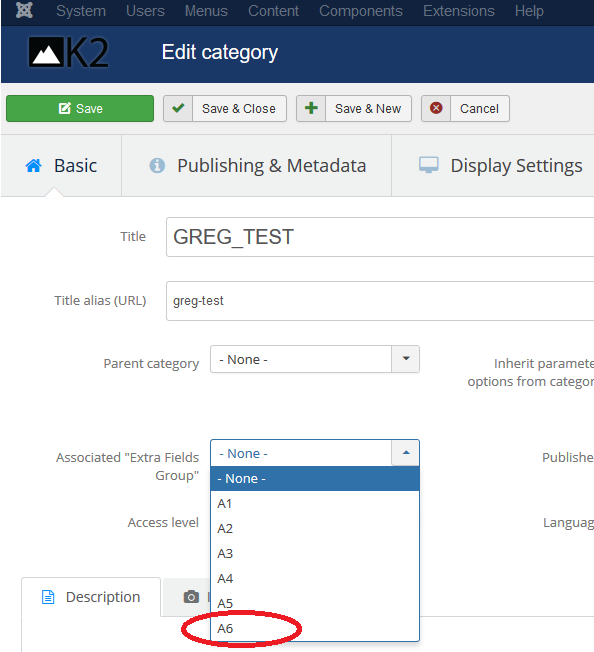 Hi, there is a problem with choosing the Associated "Extra Fields Group" at the corresponding dropdown field when editing a K2 Category. Lets assume the following example, I have six groups (A1-A6) and I have chosen 10 groups to be shown (image 1), then when I edit a K2 Category the 6 available groups are shown in the dropdown (image 2) and everything works fine. 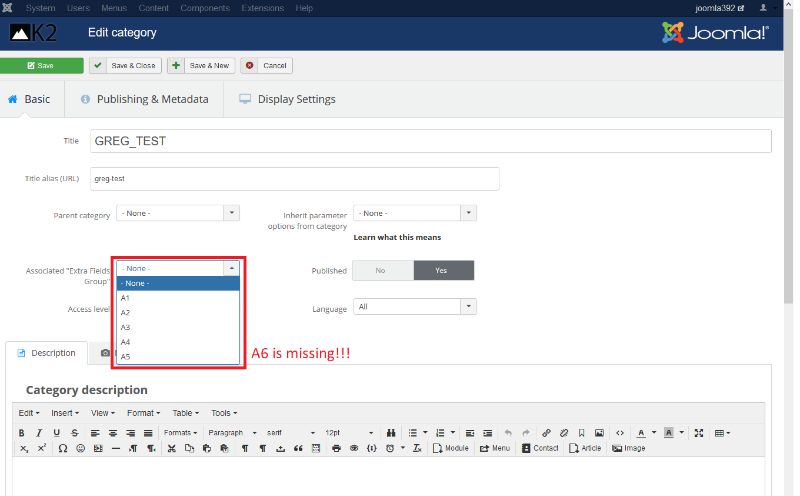 However, when I choose to fetch only 5 groups per page (image 3) then the 6th group is not available anymore in the dropdown list of the Category (image 4). This caused me a lot of trouble because 1) I accidentally removed the Associated group when I saved the Category without noticing that (it was like removing the Associated group intentionally) and 2) I lost the extra fields' content of the K2 items of that category, which I made changes. 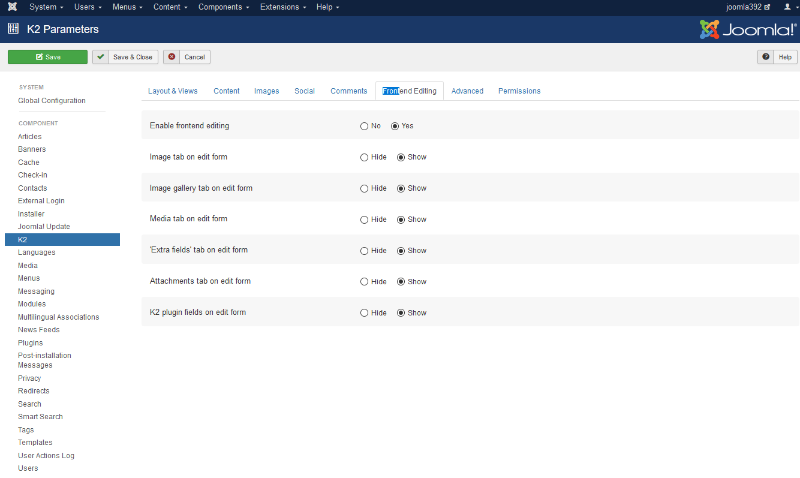 The above are also tested in a new clean installation of 3.9.2 Joomla and 2.9.0 K2. Last edit: 3 months 1 week ago by Greg. It seems we're using the same data model to render both lists and as such a limit is applied in both cases from the pagination cookie. I'll modify the code to bypass this limit when appearing in form dropdowns and also check for similar issues with other data lists. I'll keep you posted once I fix this today. Fixed in v2.9.1 (dev) which you can grab from github.com/getk2/k2/archive/master.zip and simply install on top of what you have already. The dropdown was also fixed in the categories' batch routine. Last edit: 3 months 1 week ago by Fotis. Unfortunately, after the update I face a front end problem. When I edit a Κ2 item (or adding a new one) then automatically it get unpublished. Then, I have to publish it from back end. Last edit: 3 months 6 days ago by Greg. 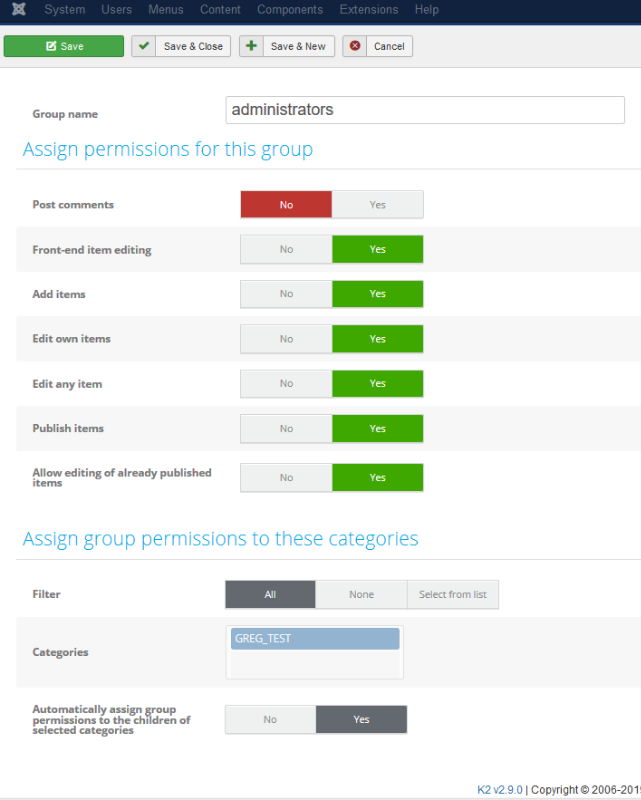 Check your frontend permissions in the related K2 User Group. Thank you for the response. I have already checked this with no luck. Can you share a screenshot of your settings please? Also, make sure the user you use (or others used) belongs to the correct K2 User Group. After applying the above fix for K2, the problem happens on 3 sites as well as on the clean installation used in the first post. To be as sure as possible for the cause of the problem, I am sending the front end settings of the clean installation. Last edit: 3 months 5 days ago by Greg.